Simon and Maia are being ultra sweet and cute together. Maia’s all worried about the Seelie mark on him but Simon’s pretty chill because he likes flirting with her and all is good so he’s not worried about invisible Seelie marks. Also they try to eat together with geeky quizzes and Simon still tries but can’t actually eat food which is both disgusting and cute. The local werewolves also take issue with Maia sleeping with Simon and want her to get rid of him to which Maia has a firm hell no and promises a world of pain to anyone who keeps pushing this. I would say Luke would get involved but I don’t think Luke even remembers he has a werewolf pack. He’s busy going to the institute, worrying about Lillith’s growing cult of possessed nice people and giving Izzy advice on work life balance using himself as an apt cautionary tale. The date is every bit as awkward as expected. Ranging from Simon having to tell Jace what Clary wants (though, to be honest, Clary if you agree to split an appetiser with Jace, don’t tell him to pick whatever he wants if you have this many food issues). And Jace knows where an intimate tattoo on Maia’s body is from when they slept together. Awkward. However I give points for Simon and Maia being super mature about this, who they slept with in the past isn’t relevant or something to be ashamed of: the now is what is important. I think Clary and Jace attempt to replicate that but Clary still has issued with Jace not sleeping with her due to his murder nightmares. Jace tries to reassure her of her specialness by mentioning all the little things he notices about her. I get that couples do this, I do this myself (though I think in real couples it’s more the hundred little things your partner does that are REALLY ANNOYING), but mentioning them aloud just seems vaguely stalkerish rather than romantic (unless it’s all those annoying things in which case it’s an argument). He’s still having murder dreams though. To Magnus and Alec and the actual plot. There’s a big party where Magnus has to officially pass on the title to next High Warlock which is just rubbing salt into the wounds but warlocks love their parties. The new High Warlock is Lorenzo, who is younger than Magnus and apparently the Worst. Because he does things like tell the Shadowhunters “hey I’m actually going to represent my people rather than be your toy” and “I’m the High Warlock, not your dial a portal because you can’t be bothered to hail a cab”. I’m not seeing Lorenzo as terribad awful because he’s not a subservient to Shadowhunter whims and a submissive servant as Magnus has turned out to be. It turns out every time Lillith uses her sacrificial victims to donate blood on the Sebastien Alter it causes all of the leylines in the city to go all dark and tained which screws up magic. No-one else knows this is Lillith and instead focus on Asmodeus, the Greater Demon who is the most powerful of them all and the one most likely to mess with Ley Lines. Lorenzo accuses Magnus of being the one behind this as he’s the Warlock most capable of using Asmodeus’s power - being his son and all. Alec overhears all this because he’s hanging around to have one of their classic 3-feet-between-them-conversations. Magnus is super embarrassed by this and doesn’t want Alec to know. I guess it’s the power thing. Or maybe knowing a specific demon is Magnus’s father is more unpleasant than just the general vague knowledge of demonic parenthood. It’s not really explained why it bothers Magnus since demonic parentage is normal for warlocks and they don’t go into much detail except be a sadness thing. They decide they need to examine the ley lines but to do that they need to go back into Lorenzo’s house- which means Alec grossly abusing his rank as head of the institute to gain access and promise he’ll investigate Magnus, honest, and by the way can i look at your extensive antique collection (not a euphemism). Which gives Magnus chance to use not subtle magic to conclude the city’s ley lines are being futzed up by evil magic - but not Asmodeus’s. It keeps happening and the next time causes a power surge in a hospital where a warlock is healing people which is messy and sad. To the institute to make a plan. 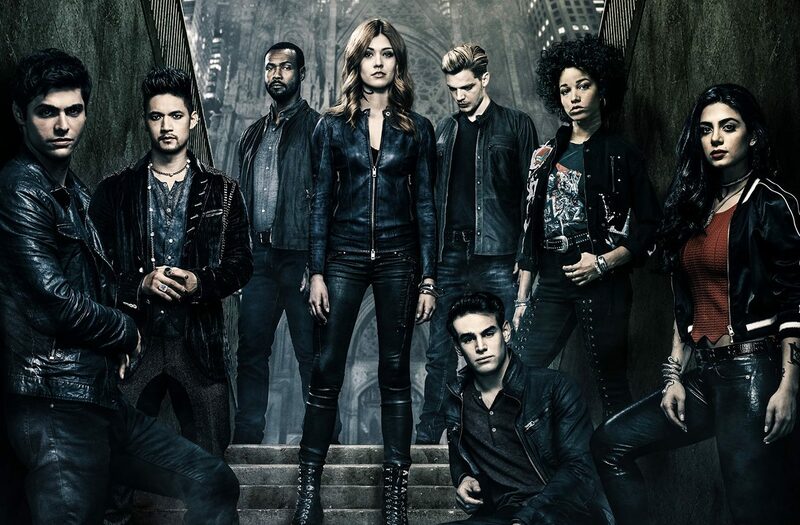 And, hey everyone kind of acknowledges that the warlocks and the seelie are experts in this but absolutely no-one thinks to involve any more of them in this despite the fact the Shadowhunters have no magic. I’d like to see this explored as the Shadowhunters allowing their prejudices to utterly blinker them to useful sources of aid, but they do like lone wolfing it. Instead the plan is to have Magnus remap the leylines of the city under the Institute so Alec can dump their shiny Angel core into the leylines and purify them. It works- though Lillith is able to protect her precious alter from all the angel shininess. And Raj & co are banished. And those werewolves try to attack Simon - but his mark on his forehead goes all shiny and throws them aside.